Before us is the work of a true impressionist master. He often worked in the open air. Monet realized that the paintings created in the open air are incredibly vital and fresh. If you create them in the workshop, then this effect is almost impossible to achieve. In this case, the artist already knows in advance what he will depict. The artist advised others and worked himself using a certain approach to reality. It is necessary to completely distract from what is in front of you. You only need to think about it until there is a definite impression of what he saw. The impression becomes a visual impulse, which is created under the influence of what the artist sees at a certain moment. We see luxurious irises. One gets the impression that these are not flowers, but the real sea, which attracts with its depth. Blue transitions are impressive. The artist deliberately does not register the details. The expressiveness of his creation is in these broad brushstrokes, surprising with its special relief. Irises are incredibly tangible and fabulous. The artist seeks to convey not a clear picture of what he saw, but his impressions of it. In his mind, irises are associated with a real abyss, which attracts and fascinates everyone who admires it. Impressive skill of the author. His colors are fresh natural. He feels the slightest nuances of color and conveys the depth of each shade. It is no coincidence that only a few iris flowers are spelled out in detail. For the artist we mean the whole landscape as a whole, which is perceived by him in this way. The viewer looks at the picture through the eyes of Monet himself and penetrates the deepest secrets of his soul. 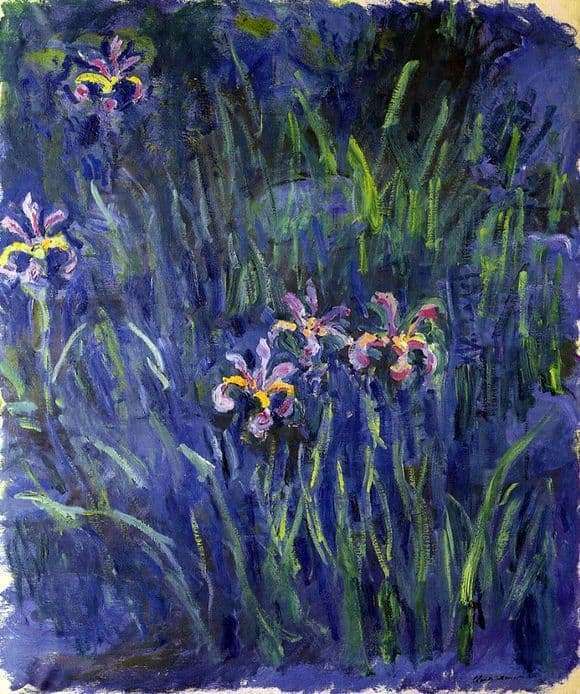 The artist sought to capture the fleeting impression that this magnificent picture of blooming irises made on him. It slips away, so keeping it on canvas is very difficult. This is only a true master.